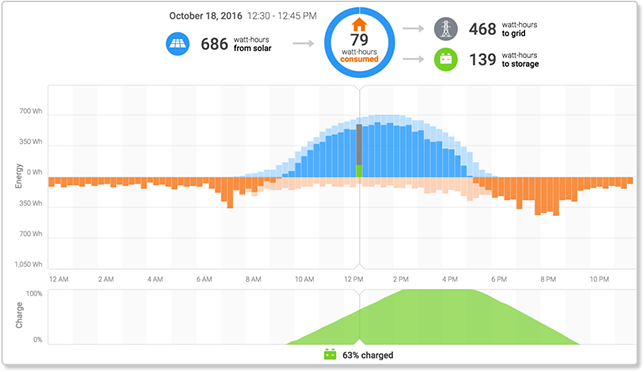 The energy graph on the overview screen shows your system’s energy in 15-minute periods throughout the day. The graph shows different information depending on the components of your Enphase home energy system. If your system has solar production monitoring only, each blue bar on the graph represents the energy that was produced during a fifteen-minute period. The energy graph at the bottom of the overview screen provides detailed information about your system’s production through the day. Each blue bar represents the energy that was produced during a 15-minute period. If you have consumption monitoring, the energy graph shows consumption as well as production data, and displays the net energy calculation for each 15-minute period throughout the day. If your system includes Enphase AC Batteries, the energy graph shows a diagram of the flow of energy into and out of your home over the course of the day. For each 15-minute period, you can see how much energy was generated by solar, how much energy your home consumed, how much energy you imported from or exported to the utility grid, and how much energy you used from or stored in the AC Batteries. Color-coding on the graph shows you how much energy from each period was imported from or exported to the grid vs. how much was used from or stored in the AC Batteries. The portion in grey is the net energy for the period. A smaller graph below the Energy graph shows the AC Batteries’ state of charge over the course of the day. You can also access energy data in the Enlighten mobile app. Simply navigate to the Energy screen, select the timeframe you would like to review for energy totals. Drag your finger across the graph to display power data for a specific reporting cycle.